We will be reading these books over the next few weeks and we would like to let someone else enjoy reading them too. 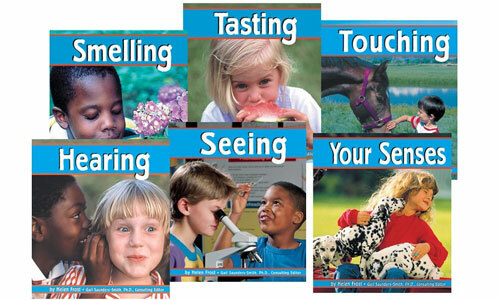 In this series, simple text introduces readers to the five senses. Engaging full-colour photos show both how the senses work and how people use their senses to explore the world. These books are selected as 2000 Science Books and Films Association Top Titles! Includes Hearing, Seeing, Smelling, Tasting, Touching, and Your Senses. 24 pages each. 6″ x 7″. Reading level 1-3. Ages 4-8. All you need to do is leave a comment, on any post, before Monday 14th November 5pm Central Time. I can definately see this blog being a great tool for us as parents to teach our children. Thank you. I’ve posted a link to your blog on our daycare’s website – lots of good ideas here. Thank you Gord and Linda. Let me know which activities worked for you and your little ones. Congrats Linda. You will receiving The Senses book set. Thank for your comments.